Grease Duct Cleaning in Orange CA | Flue Steam Inc. 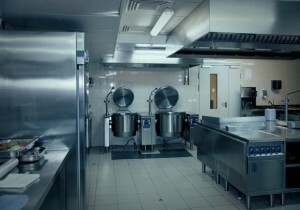 Protect your commercial kitchen with grease duct cleaning in Orange CA. Professional grease duct cleaning in Orange CA is very important for removing accumulated grease that could otherwise create a fire hazard. As a commercial kitchen owner, no doubt you already know this. But do you already know who to call for this service? Here are some important reasons to choose Flue Steam for your next grease duct cleaning in Orange CA. We are a 40-year veteran of the industry. Over the course of our 40 years of experience in kitchen air control and fire suppression, we’ve developed a reputation for excellence in the quality of our work and in the caliber of our people. We have ample experience in meeting and exceeding code requirements for clean and safe kitchen ductwork. Our technicians are certified. As a member of the International Kitchen Exhaust Cleaning Association, we are proud to employ individuals who have completed rigorous IKECA training courses in exhaust duct cleaning and other topics. Because IKECA certifications are not given for life but must be renewed periodically, you can rest assured that our employees will always have the skills and knowledge required to complete grease duct cleaning in Orange CA up to the latest industry standards. We offer two types of cleaning. Both hand scraping and steam cleaning services have their uses. Hand scraping is affordable and useful for removing grease from areas with fast, heavy buildup, while steam cleaning costs more but is vital for long term duct maintenance, as it can reach to every corner of the system to dissolve dangerous but slow-growing grease deposits. We help you tailor your cleanings to the needs of your business. Often, business owners struggle to figure out just how often they should be getting grease duct cleaning in Orange CA. Should it be every month as recommended, or some other interval? At Flue Steam, we measure the depth of grease deposits in your ducts before each cleaning. Using this data, you can begin to project when a dangerous depth is likely to be reached and adjust the frequency of your cleanings accordingly. This helps strike a balance so you don’t risk costly overcleaning or dangerous undercleaning. We help you stick to your cleaning schedule. At Flue Steam, we do our best to respond to all requests for grease duct cleaning in Orange CA promptly so you don’t risk falling behind on this important safety measure. We also provide convenient stickers that state the date of the last cleaning to help satisfy code inspectors and help remind you when to schedule your next cleaning. 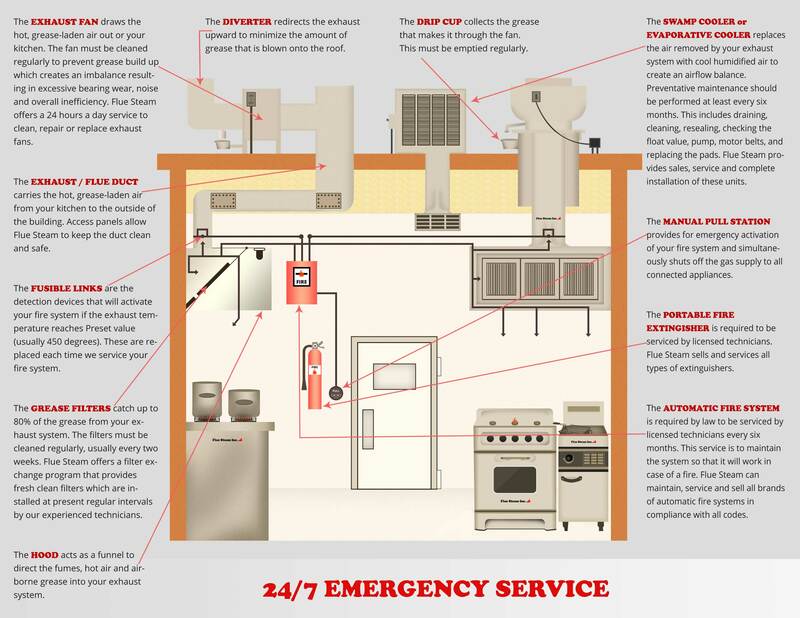 As your local kitchen air control and fire suppression experts, we do more than clean your ducts. We also service swamp coolers and install and maintain automatic fire suppression systems in order to further support the safety of your kitchen. Please call today to find out more about our services.